Elite Hikers First Aid Kit - Three Compartments, Easy Access To Supplies, First Aid Supplies Specific To Hiking Injuries | BUDK.com - Knives & Swords At The Lowest Prices! 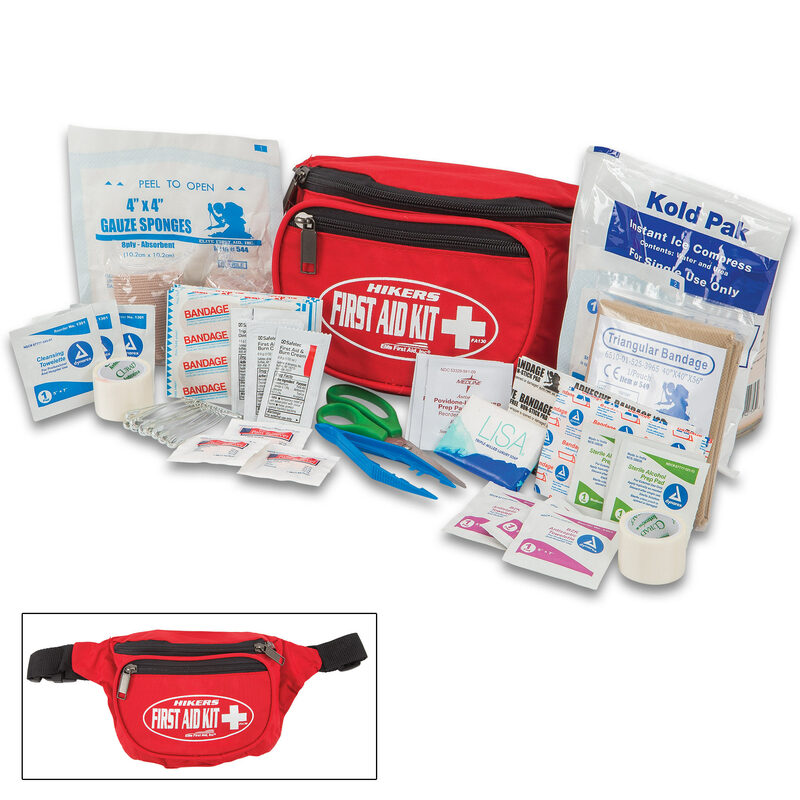 Having a quality first aid kit with you when you’re out on the trail is an absolute necessity! You can’t control what might happen, but you can control how prepared you are if it does. 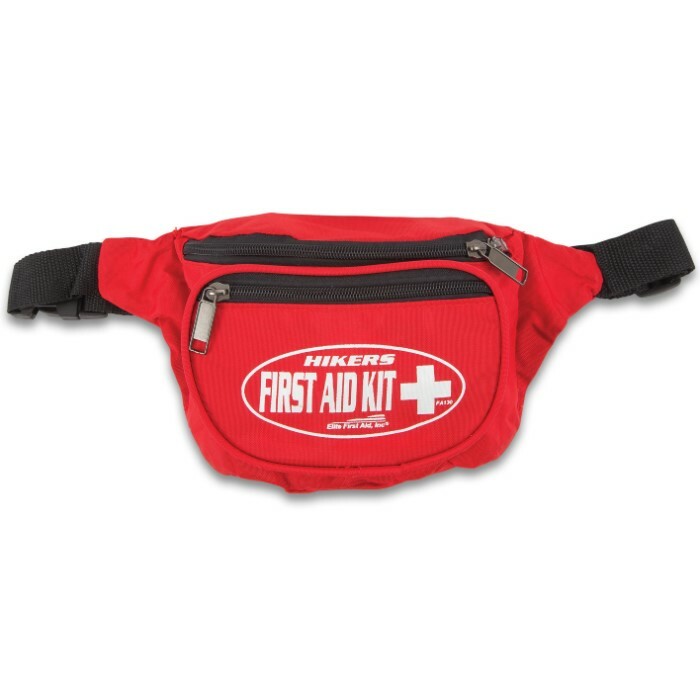 The Elite Hikers First Aid kit is a three-compartment fanny pack that offers easy access to first aid supplies when they are most needed. The kit is compact and lightweight and is packed with items specific to the types of injury that may occur when you’re hiking. 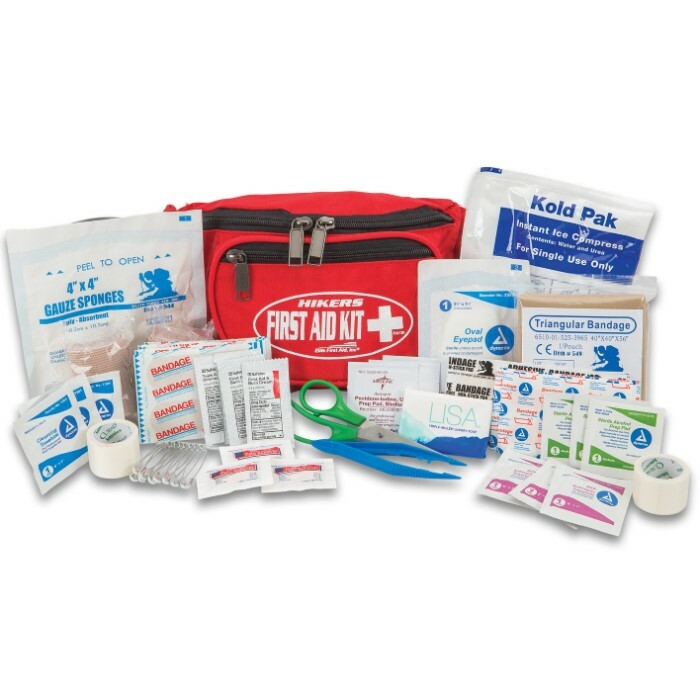 The kit comes shrink wrapped with a list of the first aid contents, which includes three 2”x4” bandage strips, hand soap, two 2” elastic bandages, a 4”x4” sterile gauze, five knuckle bandages, 16 1”x3” bandage strips, an ice pack, tweezers, scissors, six safety pins, first aid instructions, two packages of first aid cream, two packages of triple antibiotic, two 1/2” rolls of tape, six alcohol wipes, six iodine wipes, six antiseptic wipes, six clean wipes, a triangular bandage, an eye pad, six packages of pain reliever/aspirin and a pair of latex gloves.